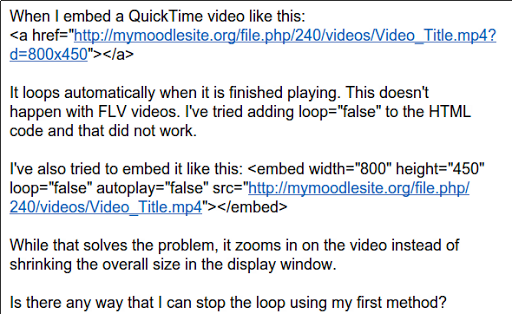 Update: The FLV solution using JWPLAYER works like a charm in Moodle 2.0. Forget what I wrote earlier since it didn’t work on my Mac browsers (although it worked flawlessly on UbuntuLinux…go figure). You can see what success looks like online as of Friday, 12/3/2010. Obviously, the link will go down after awhile. You can see what success looks like at http://excel.saisd.net/itech as of Friday, 12/3/2010. Download JWPLAYER, a free Flash video player and put it on your server in a directory somewhere that’s easy to link to. If you like, you can just change the blue code to try it out (smile). The source for this eureka moment–because i never would have figured it out–is this forum post.